A 25 pound pail containing 25 water soluble pouches. It is a powerful, nonpathogenic spore blend that incorporates six unique strains from three species of Bacillus. It contains Six (6) Bacillus strains that were selected for function as well as by how well they work together to degrade difficult waste. The Bacillus are facultative microorganisms, meaning they can function with or without oxygen. It functions in diverse environments. It contains only those Bacillus species listed in the AAFCO Official Publication, section 36.14, Direct-Fed Microorganisms. It uses the submerged fermentation process in a sterile environment to manufacture the Bacillus. The closed production system controls contamination from other Bacillus and microorganisms. One strain at a time is grown to ensure the highest quality. Spores are separated from spent media by centrifugation and dried to preserve activity. Each fermentation batch is QC tested for purity and spore concentration. The QC approved strains used in the formulation sold to you, are each put in at the ratio needed for best product performance. Final product is QC tested for Bacillus count ensures best product performance. Final product is QC tested for the absence of the microorganism Salmonella so it is safe for handling. It reproduces quickly so it can work fast. 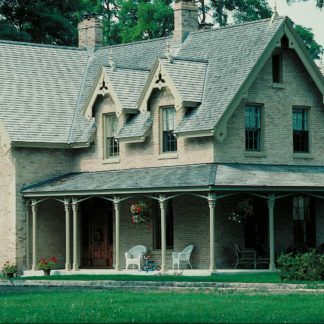 Tests have shown that strength of product does not diminish after 10 years of storage. Tested product was stored in a warehouse with temperatures stayed between freezing and 100 degrees Fahrenheit. It produces many enzymes which digest a wide variety of materials. It is shelf stable and does not need special handling such as refrigeration. It is easy to use. Just toss pre-measured pouches into water containing waste. It comes with a Certificate of Analysis for every batch. It does not contain formaldehyde. 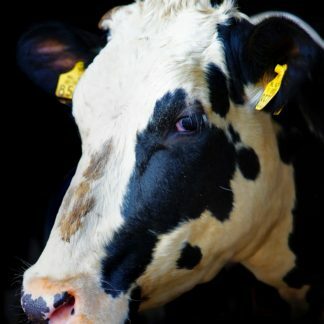 The average dairy cow generates 88 pounds of milk per day 305 days a year. 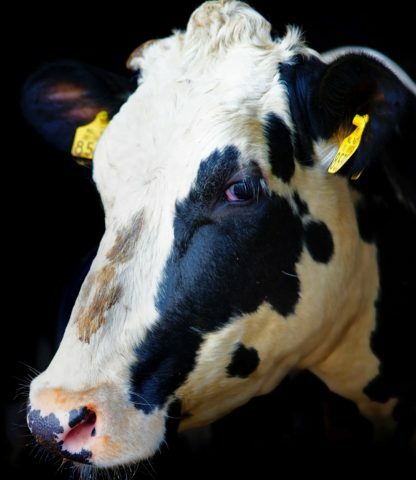 A cow creates about 20 pounds of dry manure per day. A lagoon collects between 25 and 100 gallons of urine, bedding, excrement, and flush water per cow per day. 100 gallons if cows live full-time on flushable concrete. 100,000 lbs of milk produced if 100% of waste goes into the lagoon. 200,000 lbs of milk produced if 50% of waste goes into the lagoon. 300,000 lbs of milk produced if 25% of waste goes into the lagoon. At the 100% capture rate = 26.4 pounds per month per 1000 cows. Basically 1 pail per month. At the 50% capture rate = 13.2 pounds per month per 1000 cows. Basically 1/2 pail per month. At the 25% level rate = 6.6 pounds per month per 1000 cows. Basically 1/4 pail per month. At the 100% capture rate = Three 1-pound pouches per month per 100 cows. Basically 1 pail per month. At the 50% capture rate = One-and-a-half 1-pound pouches per month per 100 cows. At the 25% level rate = Seven 1-pound pouches per month per 100 cows. First treatment should be 3 times monthly amount and if not treated for more than three months, then restart by making the next treatment as if it were the first. Dairies that prosper and expand have better managed the four obstacles listed below. Those obstacles have become more technical and complicated and increasingly regulated by the Environmental Protection Agency’s (EPA) 2008 Concentrated Animal Feeding Operations Rule. Has little or no crust on the surface. Keeps solids suspended in slurry. Can be emptied with a pump. Dairies have been investing in mechanical devices or physical processes that require energy costs and increased labor both of which are too costly for the small farmer and hurts profits for the large farmers. Dairies have also allowed their lagoons to form a crust at the surface to trap unwanted odors from escaping. Lagoons can be kept in slurry without crusting on the surface, sides, and bottom without emitting odors through bioaugmentation. 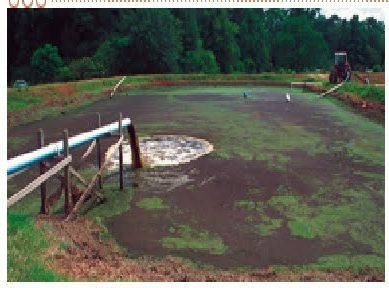 Dairy manure lagoons are inherently anaerobic (lack oxygen) and therefore the raw bacteria that is present stops working due to the absence of oxygen. Solids, if left on their own, don’t decompose in dairy waste lagoons. As a result, degradation must occur under septic conditions which are slow, odorous, and yield incomplete conversions of waste. 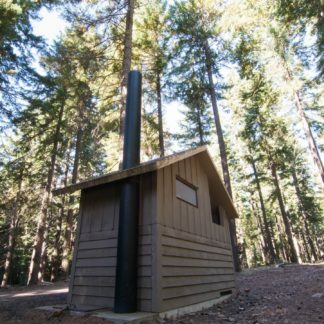 The biological processes working in septic conditions convert hydrogen and sulfur to form hydrogen sulfide and transform carbon into methane. That’s not all. 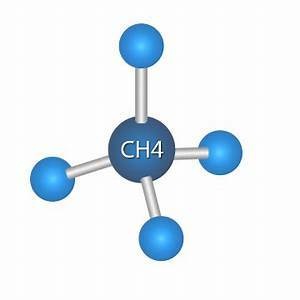 Other carbon will be converted to organic acids that create low pH conditions in the basin and make the water more difficult to treat. That is a problem because those low pH conditions promote odors. That’s when neighbors start to complain and employees have unhealthy work environments. It has also triggered California to require dairies to reduce methane releases from lagoons by 40%. Animal waste will only partially decompose on its own. What does not decompose either floats and forms a solid crust or sinks to the bottom and stops decomposing. Partially decomposed waste will also stick to the sides of lagoons. 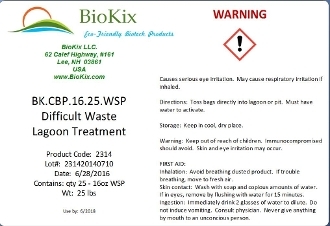 This causes your lagoon to continuously get smaller unless BioKix Dairy Lagoon Waste Treatment Bacillus is used to more fully decompose the waste. Deep accumulations of sludge on the lagoon floors and sides caused by non-treatment require frequent removal by tractors or the lagoon will become too small to hold the amount of waste coming in. Those removed solids have to be stored elsewhere on the farm but by using BioKix Dairy Lagoon Waste Treatment Bacillus, it can instead be pumped out of your lagoon to help irrigate crops with a nutrient rich slurry that has far less odor. Manure lagoons need bacteria having specific strains of microbes that are very effective in degrading difficult swine and dairy waste, including cellulosic materials and whey. Treated lagoons with specially selected bacillus will maintain liquid slurry, break up and prevent build-up of solids and reduce nitrates. 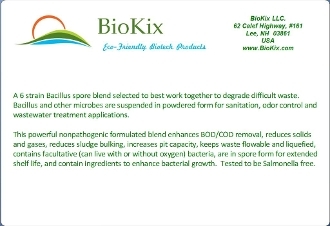 BioKix Dairy Lagoon Waste Treatment Bacillus has six strains with three different species containing two strains each. The specific number of strains was determined in order to provide the most complete, robust product possible. 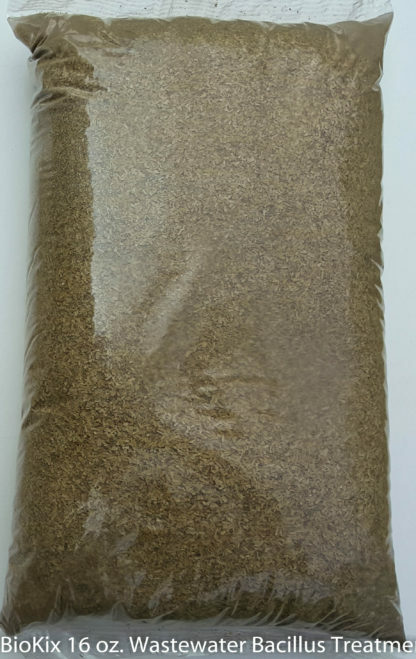 It has the best genus, species, and strains of bacteria and therefore will better enhance BOD/COD removal, reduce solids and gases, reduce sludge bulking, increase pit capacity, keep waste flowable and liquefied. As a result, dairy management becomes easier, requires less labor and less energy consumption while using less capital equipment. Since more than one species and strains are in the product they were selected to work well together and have different roles. Strength or potency is measured in colony forming units (CFUs). Bacillus multiplies quickly with binary growth initially that increases to exponential growth and abundantly self-creates enzymes. As a result, BioKix products have the horsepower and the engineering to outperform alternatives and do it at less cost. Manufacturing is done in a safe environment that protects employees and meets all governmental regulations. The manufacturing has 3rd party certification for Hazard Analysis Critical Control Points and complies with requirements for risk-based preventive controls mandated by FDA Food Safety Modernization Act’s (FSMA) modernized Current Good Manufacturing Practices (CGMPs).